Robots often get hard done by on film. Barring the odd WALL-E and Johnny Five, they generally spend most of their cinematic life trying to murder us good old humans. Not so in the terrific 'Robot & Frank' though. 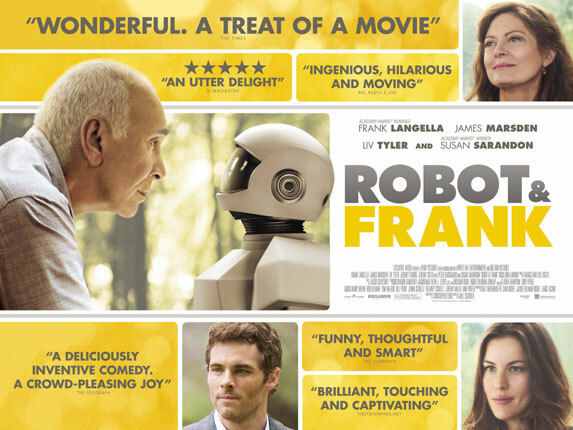 Set in the near future, Frank Langella stars as Frank, an elderly man whose forgetfulness causes his son to invest in a robot "butler" - much to the chagrin of Frank. Until he realises that his new robot could actually be quite handy. Frank's son (James Marsden) hopes that the robot (voiced by Peter Sarsgaard) will help slow his father's descent into dementia - not quite willing to send his father into a care home but equally tiring of having to make frequent visits. Frank's initial antagonistic attitude to his new robot soon disappears - indeed, 'Robot & Frank' becomes a touching examination of friendship and overcoming one's prejudices. The development of the duo's relationship and the ensuing hijinks are beautifully played out, so much so that I highly recommend avoiding watching any full length trailer. This is all the more pertinent when reflecting the burgeoning relationship between Frank and the local librarian (Susan Sarandon) - its initial light-hearted nature slowly giving way to an immensely powerful emotional beat, delivered in a manner befitting such fine actors. Jake Schreir's debut feature was one of the most enjoyable surprises of the 2012 London Film Festival, and almost six months on, the film remains vivid in my memory. Romance, comedy, and drama come together wonderfully in this moving meditation on humanity. 'Robot & Frank' is superbly life affirming - from the witty script through to the vibrant soundtrack provided by Francis And The Lights. 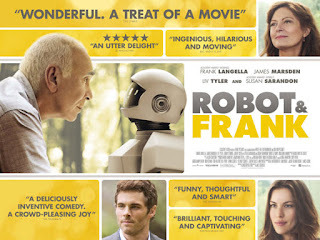 'Robot & Frank' is out in UK cinemas today, through Momentum Pictures.